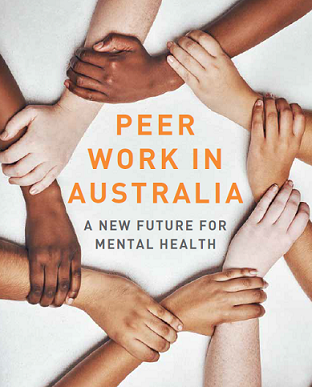 One of the most comprehensive overviews of peer work ever produced, Peer Work in Australia: A new future for mental health, covers Australia’s pioneering role and how peer work has been embraced by mainstream mental health services locally and abroad over the past 20 years. The book features a panoramic review of peer work in Australia by foremost consumer rights advocates Janet Meagher AM, Anthony Stratford, Erandathie Jayakody, Fay Jackson and Tim Fong from Mind Australia and Flourish Australia. Other contributors include NDIA mental health advisor Dr Gerry Naughtin and other advocates, service providers, academics, funding agents and policy makers. The book has been created by two of Australia’s leading community mental health support agencies, Mind Australia Limited and Flourish Australia. This is such an important resource and I’m confident … it will be a seminal thought piece and guiding light for peer work and indeed policy makers’ and service providers’ understanding and appreciation of peer work. This book offers a privileged opportunity to hear from Australia’s most recognised peer leaders on how mental health peer work can transform our services, systems and the lives of people. This book demonstrates leadership, strategy and examples of strength and resilience … (it shows peer workers as) thriving, effective members of the mental health workforce. The peer workforce is uniquely placed to operate at the forefront of change as an integral part of implementing recovery approaches for mental health. The recovery journey can feel like a rocky road, stepping stones stretched far apart… Peer workers are the guides to help smooth the bumps. Experts through experience, by mutual agreement they can help you find the smoothest path and help you stay there. Peer workers offer hope, hope that this too will pass, that it will get better. The evolution of the peer workforce in mental health, alcohol and other drugs and suicide prevention has enhanced the capability of the service delivery systems to embed hope, mutuality, trust and better connection to people with a lived experience.